An item on the BBC website yesterday reminds me that it is twenty years since the announcement, in April 1992, of the discovery of temperature variations across the sky in the cosmic microwave background radiation by the Cosmic Background Explorer (COBE). Was it really so long ago? At the time the announcement was made as I actually in the USA. In fact, I was at the University of Kansas for about a month working on this paper with Adrian Melott and Sergei Shandarin, which eventually came out early in 1993. I remember it very well because we started the project, did all the calculations and wrote up the paper within the short time I was there. Oh what it is to be a postdoc, having only research to think about and none of the other distractions that come with more senior positions. Anyway, the COBE announcement hit the news while I was there and it got a lot of press coverage. I even did a TV interview myself, for a local cable news channel. Nor surprisingly, they were pretty clueless about the physics of the cosmic microwave background; what had drawn them to the story was George Smoot’s comment that seeing the pattern of fluctuations was “like seeing the face of God”. They were disappointed when I answered their questions about God with “I don’t know, I’m an atheist”. I didn’t know at the time that the way the announcement of the COBE discovery was handled had caused such ructions. 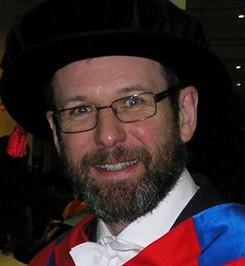 Apparently George Smoot let his enthusiasm get the better of him, broke ranks with the rest of the COBE team, and did his own press conference which led to accusations that he was trying to steal the limelight and a big falling-out between Smoot and other members of the team, especially John Mather. It’s unfortunate that this cast a shadow over what was undoubtedly one of the most important science discoveries of the twentieth century. Without COBE there would have been no WMAP and no Planck, and our understanding of the early Universe and the formation of galaxies and large-scale structure would still be in the dark ages. As a lowly postdoc at the time, living a hand-to-mouth existence on short-term contracts, I didn’t realise that I would still be working in cosmology twenty years later, let alone become a Professor. Nor could I have predicted how much cosmology would change over the next two decades. Most of all, though, I never even imagined that I’d find myself travelling to Stockholm as a guest of the Nobel Foundation to attend the ceremony and banquet at which the 2006 Nobel Prize for Physics was awarded to George Smoot and John Mather for the COBE discovery. It was a wonderful one-in-a-lifetime experience, made all the nicer because Smoot and Mather seemed to have made peace at last. Where were you when the COBE results came out? It’s National Science and Engineering Week this week and as part of the programme of events in Cardiff we have an open evening at the School of Physics & Astronomy tonight. This will comprise a series of public talks followed by an observing session using the School’s Observatory. I’m actually giving a (short) talk myself, which means it will be a long day, so I’m going to save time by recycling the following from an old blog post on the subject of my talk. As you probably know the Big Bang theory involves the assumption that the entire Universe – not only the matter and energy but also space-time itself – had its origins in a single event a finite time in the past and it has been expanding ever since. The earliest mathematical models of what we now call the Big Bang were derived independently by Alexander Friedman and George Lemaître in the 1920s. The term “Big Bang” was later coined by Fred Hoyle as a derogatory description of an idea he couldn’t stomach, but the phrase caught on. Strictly speaking, though, the Big Bang was a misnomer. Friedman and Lemaître had made mathematical models of universes that obeyed the Cosmological Principle, i.e. in which the matter was distributed in a completely uniform manner throughout space. Sound consists of oscillating fluctuations in the pressure and density of the medium through which it travels. These are longitudinal “acoustic” waves that involve successive compressions and rarefactions of matter, in other words departures from the purely homogeneous state required by the Cosmological Principle. The Friedman-Lemaitre models contained no sound waves so they did not really describe a Big Bang at all, let alone how loud it was. However, as I have blogged about before, newer versions of the Big Bang theory do contain a mechanism for generating sound waves in the early Universe and, even more importantly, these waves have now been detected and their properties measured. The above image shows the variations in temperature of the cosmic microwave background as charted by the Wilkinson Microwave Anisotropy Probe about a decade years ago. The average temperature of the sky is about 2.73 K but there are variations across the sky that have an rms value of about 0.08 milliKelvin. This corresponds to a fractional variation of a few parts in a hundred thousand relative to the mean temperature. It doesn’t sound like much, but this is evidence for the existence of primordial acoustic waves and therefore of a Big Bang with a genuine “Bang” to it. A full description of what causes these temperature fluctuations would be very complicated but, roughly speaking, the variation in temperature you see in the CMB corresponds directly to variations in density and pressure arising from sound waves. So how loud was it? The waves we are dealing with have wavelengths up to about 200,000 light years and the human ear can only actually hear sound waves with wavelengths up to about 17 metres. In any case the Universe was far too hot and dense for there to have been anyone around listening to the cacophony at the time. In some sense, therefore, it wouldn’t have been loud at all because our ears can’t have heard anything. (the 20 appears because of the fact that the energy carried goes as the square of the amplitude of the wave; in terms of energy there would be a factor 10). There is no absolute scale for loudness because this expression involves the specification of the reference pressure. We have to set this level by analogy with everyday experience. For sound waves in air this is taken to be about 20 microPascals, or about 2×10-10 times the ambient atmospheric air pressure which is about 100,000 Pa. This reference is chosen because the limit of audibility for most people corresponds to pressure variations of this order and these consequently have L=0 dB. It seems reasonable to set the reference pressure of the early Universe to be about the same fraction of the ambient pressure then, i.e. The physics of how primordial variations in pressure translate into observed fluctuations in the CMB temperature is quite complicated, and the actual sound of the Big Bang contains a mixture of wavelengths with slightly different amplitudes so it all gets a bit messy if you want to do it exactly, but it’s quite easy to get a rough estimate. We simply take the rms pressure variation to be the same fraction of ambient pressure as the averaged temperature variation are compared to the average CMB temperature, i.e. With our definition of the decibel level we find that waves corresponding to variations of one part in a hundred thousand of the reference level give roughly L=100dB while part in ten thousand gives about L=120dB. The sound of the Big Bang therefore peaks at levels just a bit less than 120 dB. As you can see in the Figure to the left, this is close to the threshold of pain, but it’s perhaps not as loud as you might have guessed in response to the initial question. Many rock concerts are actually louder than the Big Bang, so I suspect any metalheads in the audience will be distinctly unimpressed. A useful yardstick is the amplitude at which the fluctuations in pressure are comparable to the mean pressure. This would give a factor of about 1010 in the logarithm and is pretty much the limit that sound waves can propagate without distortion. These would have L≈190 dB. It is estimated that the 1883 Krakatoa eruption produced a sound level of about 180 dB at a range of 100 miles. By comparison the Big Bang was little more than a whimper. PS. If you would like to read more about the actual sound of the Big Bang, have a look at John Cramer’s webpages. You can also download simulations of the actual sound. If you listen to them you will hear that it’s more of a “Roar” than a “Bang” because the sound waves don’t actually originate at a single well-defined event but are excited incoherently all over the Universe. PPS. If you would like to hear a series of increasingly sophisticated computer simulations showing how our idea of the sounds accompanying the start of the Universe has evolved over the past few years, please take a look at the following video. It’s amazing how crude the 1995 version seems, compared with that describing the new era of precision cosmology. After a couple of boozy nights in Copenhagen during the workshop which has just finished, I thought I’d take things easy this evening and make use of the free internet connection in my hotel to post a short item about something I talked about at the workshop here. Actually I’ve been meaning to mention a nice bit of statistical theory called Extreme Value Theory on here for some time, because not so many people seem to be aware of it, but somehow I never got around to writing about it. People generally assume that statistical analysis of data revolves around “typical” quantities, such as averages or root-mean-square fluctuations (i.e. “standard” deviations). Sometimes, however, it’s not the typical points that are interesting, but those that appear to be drawn from the extreme tails of a probability distribution. This is particularly the case in planning for floods and other natural disasters, but this field also finds a number of interesting applications in astrophysics and cosmology. What should be the mass of the most massive cluster in my galaxy survey? How bright the brightest galaxy? How hot the hottest hotspot in the distribution of temperature fluctuations on the cosmic microwave background sky? And how cold the coldest? Sometimes just one anomalous event can be enormously useful in testing a theory. I’m not going to go into the theory in any great depth here. Instead I’ll just give you a simple idea of how things work. First imagine you have a set of observations labelled . Assume that these are independent and identically distributed with a distribution function , i.e. Now suppose you locate the largest value in the sample, . What is the distribution of this value? The answer is not , but it is quite easy to work out because the probability that the largest value is less than or equal to, say, is just the probability that each one is less than or equal to that value, i.e. In a situation in which is known and in which the other assumptions apply, then this simple result offers the best way to proceed in analysing extreme values. The mathematical interest in extreme values however derives from a paper in 1928 by Fisher \& Tippett which paved the way towards a general theory of extreme value distributions. I don’t want to go too much into details about that, but I will give a flavour by mentioning a historically important, perhaps surprising, and in any case rather illuminating example. where and are location and scale parameters; this is called the Gumbel distribution. It’s not often you come across functions of the form ! This result, and others, has established a robust and powerful framework for modelling extreme events. One of course has to be particularly careful if the variables involved are not independent (e.g. part of correlated sequences) or if there are not identically distributed (e.g. if the distribution is changing with time). One also has to be aware of the possibility that an extreme data point may simply be some sort of glitch (e.g. a cosmic ray hit on a pixel, to give an astronomical example). It should also be mentioned that the asymptotic theory is what it says on the tin – asymptotic. Some distributions of exponential type converge extremely slowly to the asymptotic form. A notable example is the Gaussian, which converges at the pathetically slow rate of ! This is why I advocate using the exact distribution resulting from a fully specified model whenever this is possible. The pitfalls are dangerous and have no doubt led to numerous misapplications of this theory, but, done properly, it’s an approach that has enormous potential. I’ve been interested in this branch of statistical theory for a long time, since I was introduced to it while I was a graduate student by a classic paper written by my supervisor. 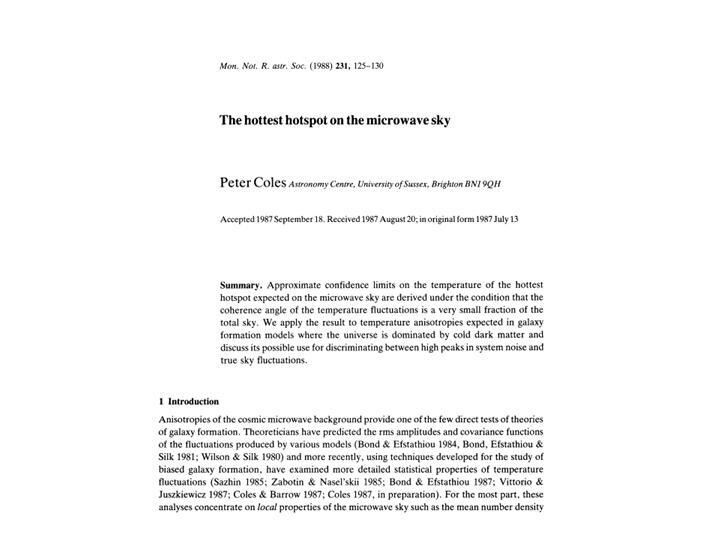 In fact I myself contributed to the classic old literature on this topic myself, with a paper on extreme temperature fluctuations in the cosmic microwave background way back in 1988..
A strange paper by Gurzadyan and Penrose hit the Arxiv a week or so ago. It seems to have generated quite a lot of reaction in the blogosphere and has now made it onto the BBC News, so I think it merits a comment. The authors claim to have found evidence that supports Roger Penrose‘s conformal cyclic cosmology in the form of a series of (concentric) rings of unexpectedly low variance in the pattern of fluctuations in the cosmic microwave background seen by the Wilkinson Microwave Anisotropy Probe (WMAP). 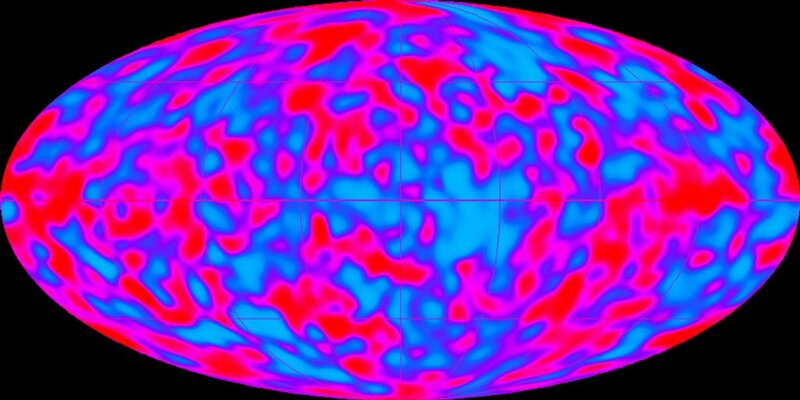 There’s no doubt that a real discovery of such signals in the WMAP data would point towards something radically different from the standard Big Bang cosmology. I haven’t tried to reproduce Gurzadyan & Penrose’s result in detail, as I haven’t had time to look at it, and I’m not going to rule it out without doing a careful analysis myself. However, what I will say here is that I think you should take the statistical part of their analysis with a huge pinch of salt. 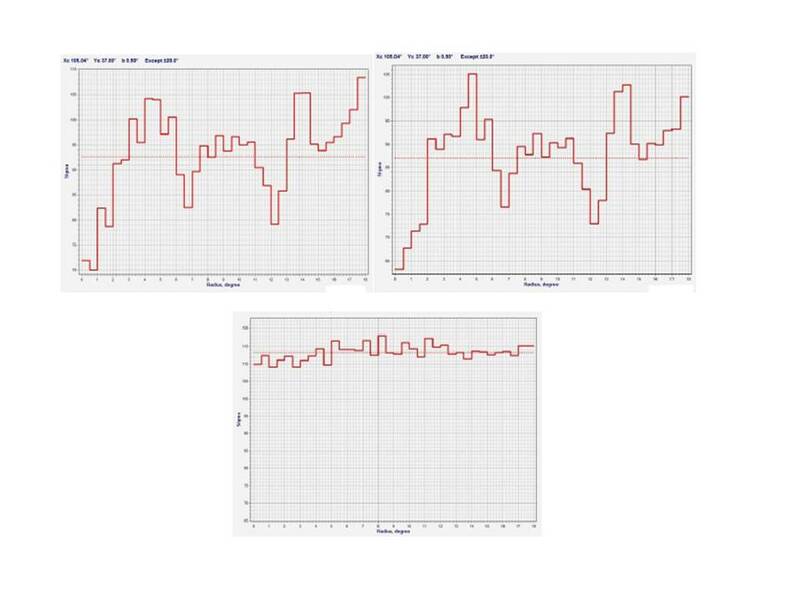 Sorry they’re hard to read, but these show the variance measured on concentric rings (y-axis) of varying radius (x-axis) as seen in the WMAP W (94 Ghz) and V (54 Ghz) frequency channels (top two panels) compared with what is seen in a simulation with purely Gaussian fluctuations generated within the framework of the standard cosmological model (lower panel). The contrast looks superficially impressive, but there’s much less to it than meets the eye. Moreover, these maps also contain considerable systematic effects arising from the scanning strategy of the WMAP satellite. The most obvious of these is that the signal-to-noise varies across the sky, but there are others, such as the finite size of the beam of the WMAP telescope. Neither galactic foregrounds nor correlated noise are present in the Gaussian simulation shown in the lower panel, and the authors do not say what kind of beam smoothing is used either. The comparison of WMAP single-channel data with simple Gaussian simulations is consequently deeply flawed and the significance level quoted for the result is certainly meaningless. Another point that I’m not sure about at all is even if the rings of low variance are real – which I doubt – do they really provide evidence of a cyclic universe? It doesn’t seem obvious to me that the model Penrose advocates would actually produce a CMB sky that had such properties anyway. Above all, I stress that this paper has not been subjected to proper peer review. If I were the referee I’d demand a much higher level of rigour in the analysis before I would allow it to be published in a scientific journal. Until the analysis is done satisfactorily, I suggest that serious students of cosmology shouldn’t get too excited by this result. IMPORTANT UPDATE: 7th December. Two papers have now appeared on the arXiv (here and here) which refute the Gurzadyan-Penrose claim. Apparently, the data behave as Gurzadyan and Penrose claim, but so do proper simulations. In otherwords, it’s the bottom panel of the figure that’s wrong. ANOTHER UPDATE: 8th December. Gurzadyan and Penrose have responded with a two-page paper which makes so little sense I had better not comment at all. I was quite interested to see, in this week’s Times Higher, a set of predictions of the winners of this years Nobel Prizes. I’ve taken the liberty of publishing the table here, although for reasons of taste I’ve removed the column pertaining to Economics. It’s quite interesting to see two sets of contenders from the field of cosmology, one from the Wilkinson Microwave Anisotropy Probe (WMAP) and another from the two groups studying high-redshift supernovae whose studies have led to the inference that the universe is accelerating thus indicating the presence of dark energy. Although both these studies are immensely important, I’d actually be surprised if either is the winner of the physics prize. In the case of WMAP I think it’s probably a bit too soon after the 2006 award for COBE for the microwave background to collect another prize. In the case of the supernovae searches I think it’s still too early to say that we actually know what is going on with the apparent accelerated expansion. You never know, though, and I’d personally be delighted if either of these groups found themselves invited to Stockholm this December. The truth is that peer review is largely hokum. What happens if a peer-reviewed journal rejects a paper? It gets sent to another peer-reviewed journal a bit further down the pecking order, which is happy to publish it. Peer review seldom detects fraud, or even mistakes. It is biased against women and against less famous institutions. Its benefits are statistically insignificant and its risks – academic log-rolling, suppression of unfashionable ideas, and the irresistible opportunity to put a spoke in a rival’s wheel – are seldom examined. In contrast to many of my academic colleagues I largely agree with Nigel Hawkes, but I urge you to read the piece yourself to see whether you are convinced by his argument. I’m not actually convinced that peer review is as biased as Hawkes asserts. I rather think that the strongest argument against the scientific journal establishment is the ruthless racketeering of the academic publishers that profit from it. Still, I do think he has a point. Scientists who garner esteem and influence in the public domain through their work should be required to defend it our in the open to both scientists and non-scientists alike. I’m not saying that’s easy to do in the face of ill-informed or even illiterate criticism, but it is in my view a necessary price to pay, especially when the research is funded by the taxpayer. It’s not that I think many scientists are involved in sinister activities, manipulating their data and fiddling their results behind closed doors, but that as long as there is an aura of secrecy it will always fuel the conspiracy theories on which the enemies of reason thrive. We often hear the accusation that scientists behave as if they are priests. I don’t think they do, but there are certainly aspects of scientific practice that make it appear that way, and the closed world of academic publishing is one of the things that desperately needs to be opened up. For a start, I think we scientists should forget academic journals and peer review, and publish our results directly in open access repositories. In the old days journals were necessary to communicate scientific work. Peer review guaranteed a certain level of quality. But nowadays it is unnecessary. Good work will achieve visibility through the attention others give it. Likewise open scrutiny will be a far more effective way of identifying errors than the existing referee process. Some steps will have to be taken to prevent abuse of the access to databases and even then I suspect a great deal of crank papers will make it through. But in the long run, I strongly believe this is the only way that science can develop in the age of digital democracy. But scrapping the journals is only part of the story. I’d also argue that all scientists undertaking publically funded research should be required to put their raw data in the public domain too. I would allow a short proprietary period after the experiments, observations or whatever form of data collection is involved. I can also see that ethical issues may require certain data to be witheld, such as the names of subjects in medical trials. Issues will also arise when research is funded commercially rather than by the taxpaper. However, I still maintain that full disclosure of all raw data should be the rule rather than the exception. After all, if it’s research that’s funded by the public, it is really the public that owns the data anyway. In astronomy this is pretty much the way things operate nowadays, in fact. Maybe stargazers have a more romantic way of thinking about scientific progress than their more earthly counterparts, but it is quite normal – even obligatory for certain publically funded projects – for surveys to release all their data. I used to think that it was enough just to publish the final results, but I’ve become so distrustful of the abuse of statistics throughout the field that I think it is necessary for independent scientists to check every step of the analysis of every major result. In the past it was simply too difficult to publish large catalogues in a form that anyone could use, but nowadays that is simply no longer the case. Astronomers have embraced this reality, and it is liberated them. To give a good example of the benefits of this approach, take the Wilkinson Microwave Anisotropy Probe (WMAP) which released full data sets after one, three, five and seven years of operation. Scores of groups around the world have done their best to find glitches in the data and errors in the analysis without turning up anything particularly significant. The standing of the WMAP team is all the higher for having done this, although I don’t know whether they would have chosen to had they not been required to do so under the terms of their funding! In the world of astronomy research it’s not at all unusual to find data for the object or set of objects you’re interested in from a public database, or by politely asking another team if they wouldn’t mind sharing their results. And if you happen to come across a puzzling result you suspect might be erroneous and want to check the calculations, you just ask the author for the numbers and, generally speaking, they send the numbers to you. A disagreement may ensue about who is right and who is wrong, but that’s the way science is supposed to work. Everything must be open to question. It’s often a chaotic process, but it’s a process all the same, and it is one that has servedus incredibly well. I was quite surprised recently to learn that this isn’t the way other scientific disciplines operate at all. When I challenged the statistical analysis in a paper on neuroscience recently, my request to have a look at the data myself was greeted with a frosty refusal. The authors seemed to take it as a personal affront that anyone might have the nerve to question their study. I had no alternative but to go public with my doubts, and my concerns have never been satisfactorily answered. How many other examples are there wherein application of the scientific method has come to a grinding halt because of compulsive secrecy? Nobody likes to have their failings exposed in public, and I’m sure no scientists likes see an error pointed out, but surely it’s better to be seen to have made an error than to maintain a front that perpetuates the suspicion of malpractice? Another, more topical, example concerns the University of East Anglia’s Climatic Research Unit which was involved in the Climategate scandal and which has apparently now decided that it wants to share its data. Fine, but I find it absolutely amazing that such centres have been able to get away with being so secretive in the past. Their behaviour was guaranteed to lead to suspicions that they had something to hide. The public debate about climate change may be noisy and generally ill-informed but it’s a debate we must have out in the open. I’m not going to get all sanctimonious about `pure’ science nor am I going to question the motives of individuals working in disciplines I know very little about. I would, however, say that from the outside it certainly appears that there is often a lot more going on in the world of academic research than the simple quest for knowledge. Of course there are risks in opening up the operation of science in the way I’m suggesting. Cranks will probably proliferate, but we’ll no doubt get used to them- I’m a cosmologist and I’m pretty much used to them already! Some good work may find it a bit harder to be recognized. Lack of peer review may mean more erroneous results see the light of day. Empire-builders won’t like it much either, as a truly open system of publication will be a great leveller of reputations. But in the final analysis, the risk of sticking to our arcane practices is far higher. Public distrust will grow and centuries of progress may be swept aside on a wave of irrationality. If the price for avoiding that is to change our attitude to who owns our data, then it’s a price well worth paying. Interesting press release today from the Royal Astronomical Society about a paper (preprint version here) which casts doubt on whether the Wilkinson Microwave Anisotropy Probe supports the standard cosmological model to the extent that is generally claimed. Apologies if this is a bit more technical than my usual posts (but I like occasionally to pretend that it’s a science blog). Using the published WMAP 5-year data, we first show how sensitive the WMAP power spectra are to the form of the WMAP beam. It is well known that the beam profile derived from observations of Jupiter is non-Gaussian and indeed extends, in the W band for example, well beyond its 12.’6 FWHM core out to more than 1 degree in radius. This means that even though the core width corresponds to wavenumber l ~ 1800, the form of the beam still significantly affects the WMAP results even at l~200 which is the scale of the first acoustic peak. The difference between the beam convolved Cl; and the final Cl is ~ 70% at the scale of the first peak, rising to ~ 400% at the scale of the second. New estimates of the Q, V and W-band beam profiles are then presented, based on a stacking analysis of the WMAP5 radio source catalogue and temperature maps. The radio sources show a significantly (3-4σ) broader beam profile on scales of 10′-30′ than that found by the WMAP team whose beam analysis is based on measurements of Jupiter. Beyond these scales the beam profiles from the radio sources are too noisy to give useful information. 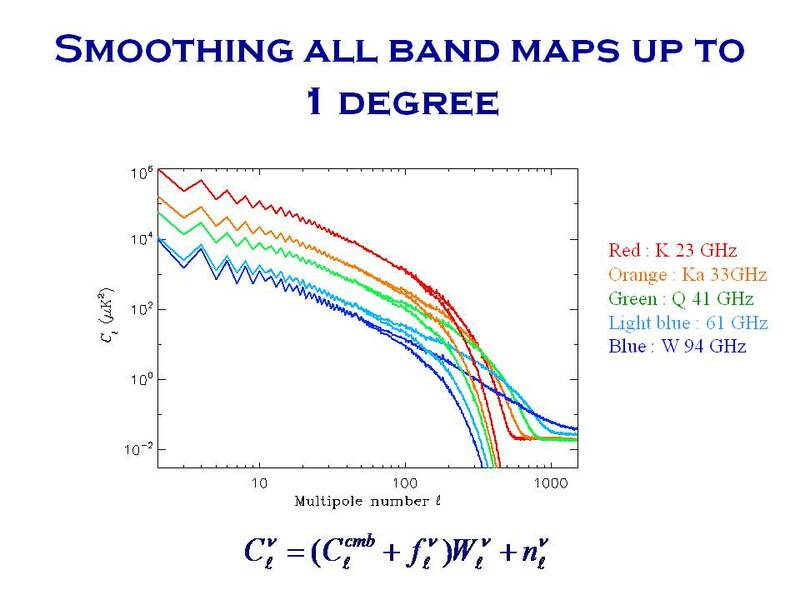 Furthermore, we find tentative evidence for a non-linear relation between WMAP and ATCA/IRAM 95 GHz source fluxes. We discuss whether the wide beam profiles could be caused either by radio source extension or clustering and find that neither explanation is likely. We also argue against the possibility that Eddington bias is affecting our results. The reasons for the difference between the radio source and the Jupiter beam profiles are therefore still unclear. 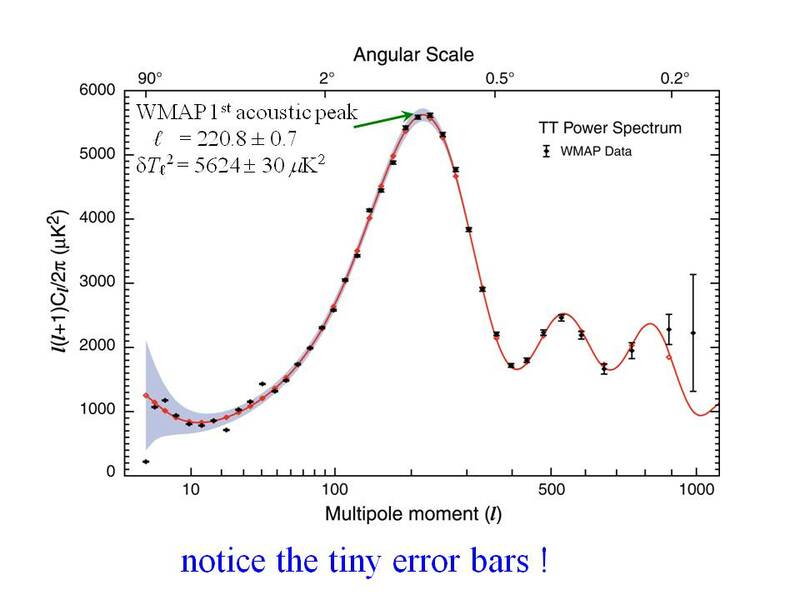 If the radio source profiles were then used to define the WMAP beam, there could be a significant change in the amplitude and position of even the first acoustic peak. It is therefore important to identify the reasons for the differences between these two beam profile estimates. New research by astronomers in the Physics Department at Durham University suggests that the conventional wisdom about the content of the Universe may be wrong. Graduate student Utane Sawangwit and Professor Tom Shanks looked at observations from the Wilkinson Microwave Anisotropy Probe (WMAP) satellite to study the remnant heat from the Big Bang. The two scientists find evidence that the errors in its data may be much larger than previously thought, which in turn makes the standard model of the Universe open to question. The team publish their results in a letter to the journal Monthly Notices of the Royal Astronomical Society. I dare say the WMAP team will respond in due course, but this paper spurred me to mention some work on this topic that was done by my friend (and former student) Lung-Yih Chiang. During his last visit to Cardiff we discussed this at great length and got very excited at one point when we thought we had discovered an error along the lines that the present paper claims. However, looking more carefully into it we decided that this wasn’t the case and we abandoned our plans to publish a paper on it. The position of the so-called “acoustic peak” plays an important role in determining the overall curvature of space-time on cosmological scales and the higher-order peaks pin down other parameters. 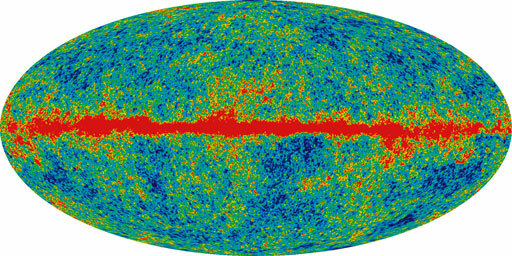 However, it must be remembered that WMAP doesn’t just observe the cosmic microwave background. The signal it receives is heavily polluted by contamination from within our Galaxy and there is also significant instrumental noise. 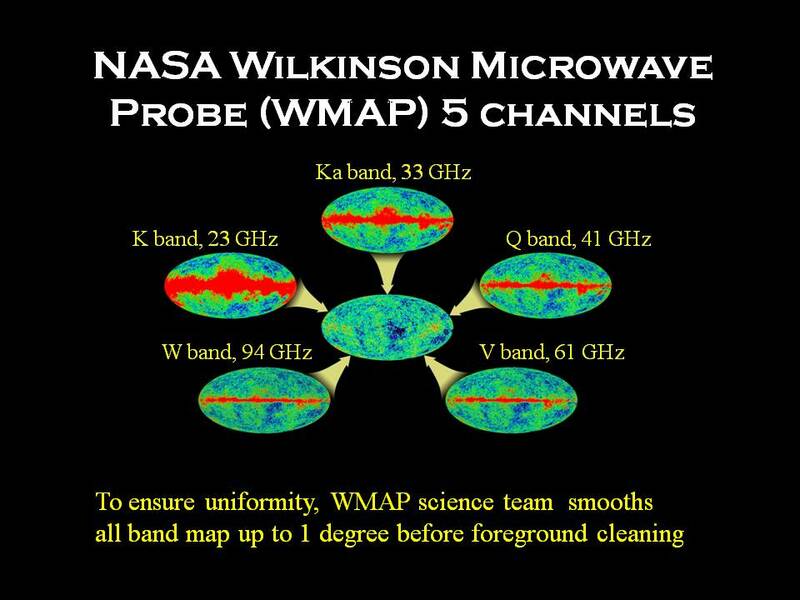 To deal with this problem, the WMAP team exploit the five different frequency channels with which the probe is equipped, as shown in the picture below. At each frequency the sky is blurred out by the “beam” of the WMAP optical system; the blurring is worse at low frequencies than at high frequencies. In order to do the foreground subtraction, the WMAP team therefore smooth all the frequency maps to have the same resolution, i.e. so the net effect of optical resolution and artificial smoothing produces the same overall blurring (actually 1 degree). This requires accurate knowledge of the precise form of the beam response of the experiment to do it accurately. A rough example (for illustration only) is given in the caption above. Note this is Cl not l(l+1)Cl as in the first plot of the spectrum. Now you see how much foreground there is in the data: the curves would lie on top of each other if the signal were pure CMB, i.e. if it did not vary with frequency. The equation at the bottom basically just says that the overall spectrum is a smoothed version of the CMB plus the foregrounds plus noise. Note, crucially, that the smoothing suppresses the interesting high-l wiggles. I haven’t got space-time enough to go into how the foreground subtraction is carried out, but once it is done it is necessary to “unblur” the maps in order to see the structure at small angular scales, i.e. at large spherical harmonic numbers l. The initial process of convolving the sky pattern with a filter corresponds to multiplying the power-spectrum with a “window function” that decreases sharply at high l, so to deconvolve the spectrum one essentially has to divide by this window function to reinstate the power removed at high harmonics. This is where it all gets very tricky. The smoothing applied is very close to the scale of the acoustic peaks so you have to do it very carefully to avoid introducing artificial structure in Cl or obliterating structure that you want to see. Moreover, a small error in the beam gets blown up in the deconvolution so one can go badly wrong in recovering the final spectrum. In other words, you need to know the beam very well to have any chance of getting close to the right answer! 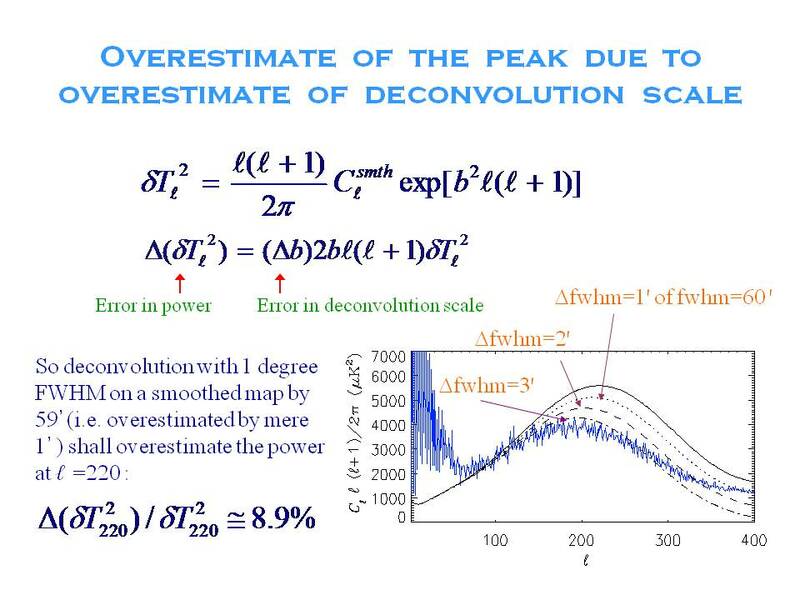 The next picture gives a rough model for how much the “recovered” spectrum depends on the error produced by making even a small error in the beam profile which, for illustration only, is assumed to be Gaussian. It also shows how sensitive the shape of the deconvolved spectrum is to small errors in the beam. Incidentally, the ratty blue line shows the spectrum obtained from a small patch of the sky rather than the whole sky. We were interested to see how much the spectrum varied across the sky so broke it up into square patches about the same size as those analysed by the Boomerang experiment. This turns out to be a pretty good way of getting the acoustic peak position but, as you can see, you lose information at low l (i.e. on scales larger than the patch). The WMAP beam isn’t actually Gaussian – it differs quite markedly in its tails, which means that there’s even more cross-talk between different harmonic modes than in this example – but I hope you get the basic point. As Sawangwit & Shanks say, you need to know the beam very well to get the right fluctuation spectrum out. Move the acoustic peak around only slightly and all bets are off about the cosmological parameters and, perhaps, the evidence for dark energy and dark matter. 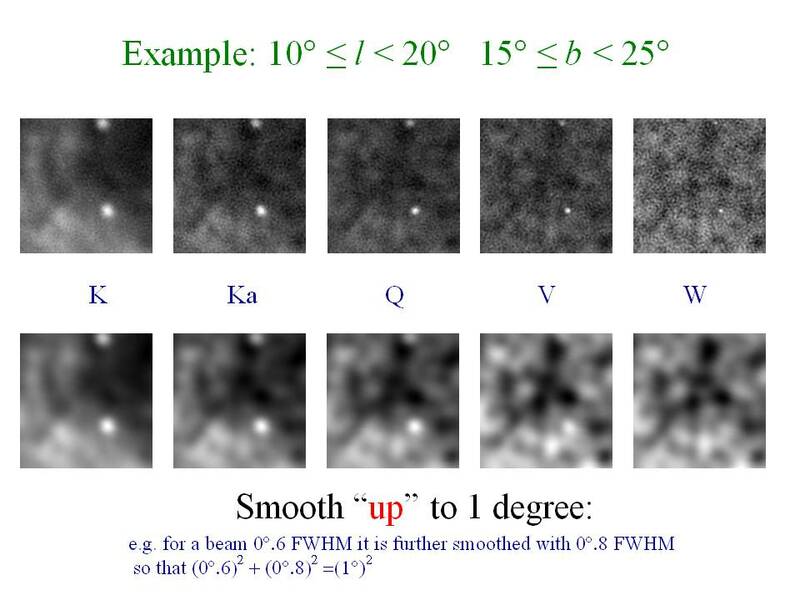 Lung-Yih looked at the way the WMAP had done it and concluded that if their published beam shape was right then they had done a good job and there’s nothing substantially wrong with the results shown in the first graph. Sawangwit & Shanks suggest the beam isn’t right so the recovered angular spectrum is suspect. I’ll need to look a bit more at the evidence they consider before commenting on that, although if anyone else has worked through it I’d be happy to hear from them through the comments box!